Computer security specialists from the 360 Threat Intelligence Center have recently discovered a malware string which is being distributed by false email messages. According to researchers, bad actors trying to convince users that the malicious attachment contains information about the compromise of other Boeing 737 MAX 8 planes used by other carriers. The rogue messages are coming from an email address info@isgec.com and provide details about the Boeing 737 MAX 8 crash which happened just recently, when an airplane of Ethiopian Airlines took-off from Addis Ababa and suddenly crashed, resulting in deaths of 157 people. Additionally, crooks also describe another accident involving the same aircraft operated by Lion Air which occurred on 29 October 2018. Flight 610 was scheduled to fly from Soekarno–Hatta International Airport in Jakarta to Depati Amir Airport in Pangkal Pinang but crashed 12 minutes after take-off, killing all 189 passengers and crew on board. While aircraft accidents are rare, they usually result in devastating consequences, so the investigations of such cases are significant not only for the families of the deceased but also investigators who consequently improve the security of the aviation for other passengers. Due to the destructive nature of the events involving the same aircraft, there is a lot of controversies surrounding it. It is evident that cybercriminals are keen on abusing the sad occasion by distributing malware in malicious email attachments. 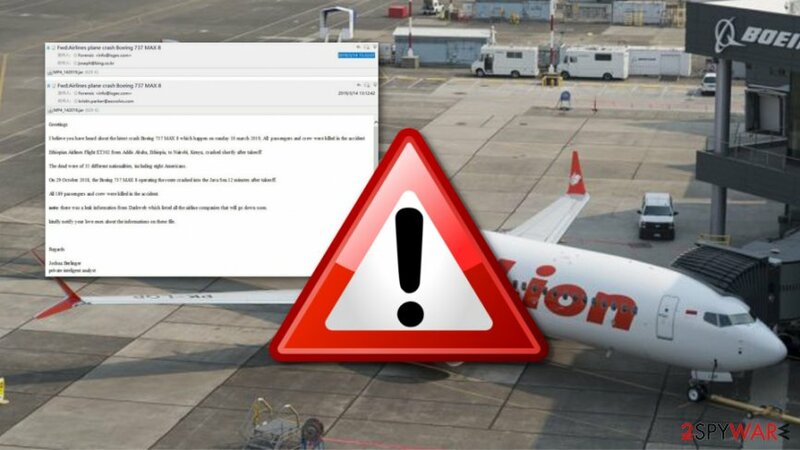 Specialists from 360 Threat Intelligence Center have noted that the malicious message comes under the subject line “Fwd: Airlines plane crash Boeing 737 Max 8” and contains an attachment MP4_142019.jar. If the user decides to open the malicious file, will be opened by JAVA and execute Houdini H-worm Remote Access Trojan, H-Worm RAT, and Adwind info-stealer. Antivirus programs such as AVG and Avast find the attached file as Java:Malware-gen [Trj]. If you are a meticulous and/or more-experienced user, you might find some differences between original emails that are sent by renown companies and their authorities, and the questionable ones, which often hint you to open attachments or click on cleverly-disguised hyperlinks. “Love ones” instead “Loved ones”, etc. All users should be cautious if they receive such messages, and broken spelling or grammar are the first signs of deception. Note that reputable, legitimate emails would not contain these mistakes and, in case the message is coming from a legitimate company, would include your real name in it. If you are not concerned about whether or not the message is real, you can contact the organization first (not by hitting “Reply” but finding contact details on the official website). Additionally, phishing emails often contain attachments that come in various formats, including .doc, .js, .html, .txt, .pdf, and others DO NOT open them before making sure that the email is not fake. In general, always scan any type of files before opening them. ^ Pierluigi Paganini. Experts uncovered a malspam campaign using Boeing 737 Max crashes. Terabit web. Relavant tech news. ^ New malspam campaign disguised as leaked documents about Boeing 737 Max crashes delivers two malware. Cyware.com. Technology news website. ^ Ethiopian Airlines: 'Clear similarities' with Indonesia crash. BBC.com. Worldwide news. ^ 360 Threat Intelligence Center. Attackers are using topics regarding Boeing 737 MAX 8 crash. Twitter. 360TIC. Status. ^ 25 engines detected this file. Virus total. File information. ^ Bill Toulas. A New Boeing 737 Themed Spam Campaign Pushes Malware. Technadu. Independent news page. This entry was posted on 2019-03-19 at 08:28 and is filed under News, Spam and phishing.